Remove the lids from the bands. Paint the lids with Gesso or white paint. Trace around the lids onto the fabric and cut out circles. Mod Podge the circles onto the lids. Cut two noses from orange fabric and decoupage them onto the fabric circles. Allow to dry completely. Use scruffy brush dipped in pink paint, excess paint dabbed off on a paper towel, to add cheeks. Trim the excess fabric around the lid. Use the handle end of the brush dipped in black paint to add eyes and mouths. Let the paint dry completely then add another layer of decoupage. Mix antiquing medium with dark brown part in equal parts. Add a coat to the snowman face and wipe back with a clean cloth. Insert the lids into the bands. Cut pieces of floral foam to one-inch heights and hot glue inside one of the lids. This will ensure that the lids will not come loose from the bands. Glue the two bands together, making sure that the faces on each side are facing the same way. Glue twine around the center of the bands, tying in a knot at the top of the ornament. Starting at the knot of twine, glue the burlap strip around the band, covering the twine, except for the top where the knot is. 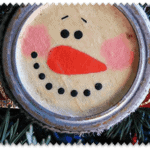 This project for Antiqued Canning Lid Snowman was printed from CraftsbyAmanda.com - https://craftsbyamanda.com/antiqued-canning-lid-snowman/ and can only be printed for education or personal use.